If there's one thing you can't deny, it's that Bill Clinton is a busy man at the moment. Beyond the usual responsibilities as a former President, and head of the enormous Clinton Global Initiative, Bill's got a brand new baby granddaughter on his hands — his daughter Chelsea gave birth to little Charlotte Friday, so you'd have to forgive him if his mind wasn't on the world's troubles right now. But, the classic Democratic politico that he is, he's still got his mind on the economy — Clinton has an income stagnancy solution, and it actually makes a lot of sense. In short, Clinton blames stagnating American income rates — which, it bears mentioning, is something of a global phenomenon across many so-called "western" nations, with Japan and some European states showing declining wages since 2010 — on a familiar culprit. Companies that aren't paying enough, because nobody is forcing them. In keeping with the Democratic Party's midterm election push, Clinton cited the federal minimum wage (which still stands at a shockingly low $7.25 per hour) as a key component, in addition to corporations using their profits to other ends, according to CNBC. Median income hasn't gone up for three reasons One is the labor markets aren't tight enough, and we haven't raised the minimum wage as we should. And the second reason is we haven't changed the job mix enough, to raise the median income and have more poor people working into it. The combination of jobs has to pay, on average, higher wages. ... Gross domestic product growth doesn't lead to growth in median incomes because company after company takes more of its profits and spends it on dividends, stock buybacks, management increases … and less on sharing it with the employees broadly. Well, when you put it like that, it all sounds so simple. This is an unavoidable reality of our capitalist system, sad to say — even as Wall Street and various corporations recover from the economic calamity, even if new profits begin streaming into their coffers, that doesn't necessarily mean they're going to raise wages. After all, when you're turning a profit, that means you're getting away with whatever the status quo is — why raise wages above the lowest levels you can get away with while still being successful? Clinton didn't limit his analysis just to items his Democratic base would cheer, however, also calling for reform to America's corporate tax system. America has to face the fact that we have not reformed our corporate tax laws when 100 percent of the people, from Democrats, Republicans, Independents, agree we need to. We have the highest overall corporate tax rates in the world. We need tax reform. What Does Clinton Know About The Economy, Anyway? 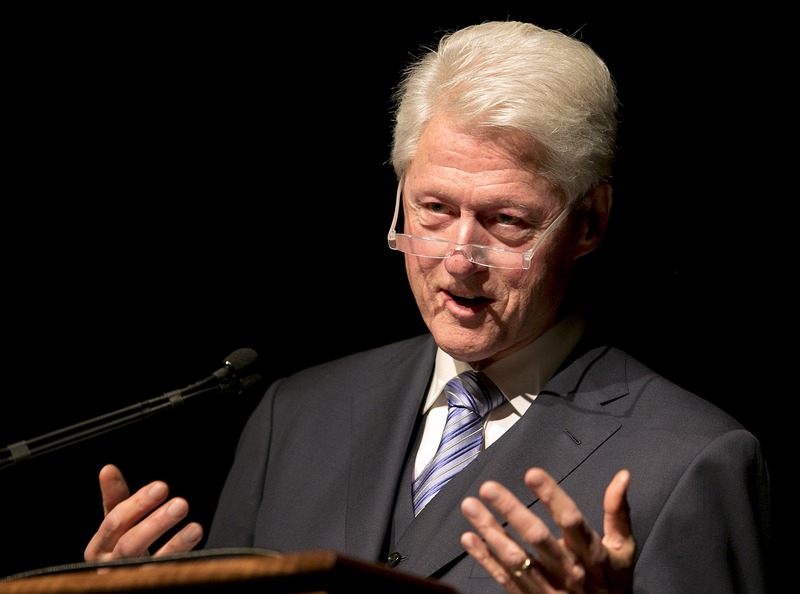 As a former president from 1992 to 2000, Clinton's economic bonafides are kind of a mixed bag. While his tenure saw some of the most robust economic growth in recent American history, and was followed by some far more harrowing times, his report card was far from perfect. As detailed in PBS' excellent Frontline documentary "The Warning," his administration's economic deference to Federal reserve chairman Alan Greenspan, as well as Treasury Secretary Robert Rubin and Lawrence Summers, helped set the stage for the catastrophic collapse of late 2007. Notwithstanding, he remains one of the Democratic Party's rhetorical standard-bearers, and the blame is far from his alone. The Bush administration's regulatory-slashing on mortgages didn't help matters one bit, after all. And in spite of how we got here, the counterfactual of Clinton's analysis does sounds mighty appealing. A higher minimum wage, and companies spreading the wealth around their employees a little more liberally? Sign me up! Of course, that won't happen on its own — companies don't usually just spread around money when they don't have to, no matter how much they have tucked away, and an increase to the federal minimum wage depends on the GOP-controlled House, which basically means "no, no, no." But who doesn't like to dream now and then?